Any kind of work or play that happens around water comes with a risk of drowning. Many maritime employees and waterside tourists understand this risk, to a certain degree, but may not fully understand all the risks. In most cases, victims die from drowning while they are submerged or immediately afterwards. Their lungs fill with water, cutting off the supply of oxygen. However, there are two types of drowning—dry drowning and secondary drowning—that can occur well after the victim came in contact with the water. Cause of the condition. Dry drowning occurs as a result of fluid irritating the vocal cords, causing them to swell and cut off oxygen to the lungs. Secondary drowning, on the other hand, occurs when fluid gets into the lungs and causes irritation. This irritation then disrupts the lubricating coating of the lungs’ airways, preventing them from opening and closing properly. In response, the body sends fluid into the lungs to wash away the intruding fluid, which causes disruption of gas exchange. This disruption prevents the lungs from absorbing oxygen and expelling carbon dioxide, which ultimately leads to asphyxiation. Onset of symptoms. 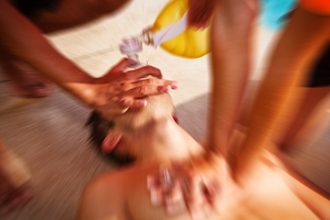 Symptoms of dry drowning can begin immediately after the incident of fluid inhalation or up to 24 hours later. Secondary drowning effects generally take up to 24 hours after the incident to begin showing signs of inflammation. Treatment. Since dry drowning affects the vocal cords, treatment must control the swelling and clear the throat to allow air flow. In many cases, intubation is required. Intubation is a process where a breathing tube is inserted into the throat to create a clear passageway for the air to flow to the lungs. Secondary drowning requires breathing treatments, oxygen level monitoring, and IV fluids to help flush out the invasive liquids. Because of the risks of delayed drowning, it is vital that any person who inhaled water in a near-drowning seek medical attention, even if he seems to be fine. Please share this article with your friends and family on Facebook to help them understand that drowning risks aren’t something to be ignored. If they work or play on the water, they need to know what, why, and how drowning can occur. What are the possible injuries I could sustain if I'm involved in a Seattle Jet Ski accident? Post a Comment to "The Differences Between Dry Drowning and Secondary Drowning"